Politicians, community VIPs and families have attended the laying of the foundations of Jewish Care’s $8.5 million Disability Respite Centre for children and adults living with disability. : Georgie Crozier MLC, Mike Debinski, David Southwick MLA, Bill Appleby, Andrea Coote MLC, The Hon Mary Wooldridge MLA, Elizabeth Miller MLA. The state-of-the-art Jewish Care Disability Respite Centre at 476-478 Glen Eira Road, Caulfield North, planned to open September 2015, is a purpose built building that has been designed around an innovative model of care, and developed through extensive communal consultation and broad industry research. 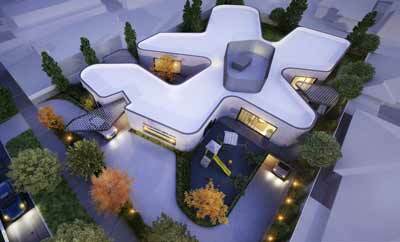 Featuring the latest in style, innovation and functionality, the unique architectural design caters for both children and adults in separate wings, each with five rooms housing a total of 10 people. It also enables comfortable and convenient transition from child to adult respite services under one roof, should the client need it. Minister for Disability Services and Reform Mary Wooldridge said community organisations like Jewish Care provide an important support for people with a disability, their families and carers. “It’s encouraging to see the steps Jewish Care is taking to provide a better quality of life for individuals and carers through providing even more respite care for people with a disability in the community,” Ms Wooldridge said. The Centre’s features include custom-built playgrounds, sensory rooms, separate succahs for children and adults, kosher kitchens and other culturally specific amenities. The building has been designed with future expansion in mind by having an oversized basement and a flat structural roof. This forethought in planning will allow for a lightweight second floor addition to be easily added in years to come. With improved facilities and increased capacity, families will benefit from the Centre being open longer and over many more days during the year. “Jewish Care is embracing the new social landscape, formalised by the federal government’s National Disability Insurance Scheme and our own Five Year Disability Plan. Laying the foundations is a significant moment in moving towards our goal of realising this vision,” said Bill Appleby, CEO Jewish Care. The new Centre will give relief to family and carers by offering a safe, homely and culturally-sensitive environment for loved ones living with disability, while increasing social and recreational opportunities and independence. 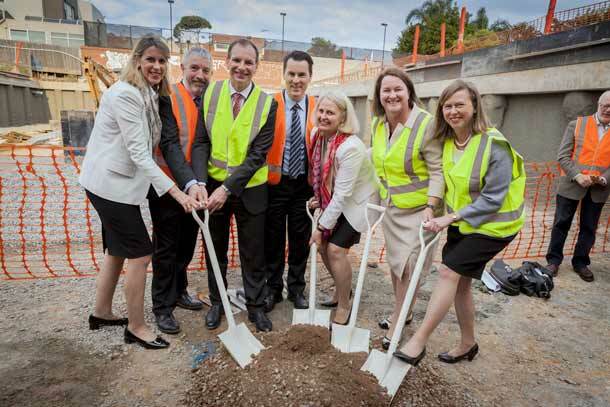 David Southwick MP, Member for Caulfield and who also chairs the Social Inclusion Leadership Committee was in attendance of the laying at the foundation ceremony. Mr Southwick applauded Jewish Care’s vision and investment. “Jewish Care continues to be a leader and innovator in the Jewish community and disability services,” Mr Southwick said. Another focal point of the Centre will be a community hub providing outreach programs, carer support services and care coordination. The hub will also provide a venue for community events and social inclusion activities. The Disability Respite Centre is the first development of a number of major capital investment projects worth $180 million over the next 10 years that will see Jewish Care grow and change the face of aged care, disability and community services for the Victorian Jewish community. The event, held on 2 October was attended by The Hon Mary Wooldridge MLA, Minister for Mental Health, Disability Services, Community Services and Reform, David Southwick MLA, Andrea Coote MLC, Georgie Crozier MLC, Elizabeth Miller MLA and Glen Eira City Council Mayor, Cr Neil Pilling.